By the time you're shopping the Flex Limited, you're well into the $50,000 price range—so consider an SEL lightly optioned if you want to keep the price tag in the low $40,000. The 2016 Ford Flex remains a singularly boxy and handsome SUV, with excellent interior room and safety scores. The Ford Flex continues to stand out in the SUV field. In a universe of softly contoured crossovers, the Flex's relentlessly rectilinear shape stands out—and provides some of the best, most polished interior space of any three-row crossover SUV. It's been on the road since the 2009 model year, and after a 2013 model-year update that included a new front end and a revamped interior, the Flex has kept fairly steady. For the 2016 model year it gains a standard rearview camera, a new black-out appearance package, and a significantly upgraded infotainment system. With the Flex, Ford has a rival for vehicles like the Honda Pilot and Buick Enclave, but it takes a few sharp turns and right angles to get there. The Flex steers clear of the cliches that drive people away from crossovers and minivans, doing a great impression of the station wagons of the past instead. It's a boxy vehicle, but in the best senses of the word. It doesn't play down its corners, it amplifies them, carving grooves in its flanks to emphasize its long, glassy greenhouse, angling off its headlamps to call out its rectangular grille. The retro-modern fusion works like a charm, down to the grille that looks like a USB port. The Flex's interior is still one of the best Ford builds, with a mix of materials matching up well, blending LCD screens and touch controls in a serene way. Ford has made good on the Flex's look by giving it good handling and strong performance. The base 3.5-liter V-6 makes 287 horsepower, but the star of the lineup remains the turbocharged, 365-hp V-6, which runs off 0-60 mph times of under seven seconds and lightens up the Flex's footwork, making it faster than anything in the class. Thanks to an electric power steering system with a quick ratio, and a steering unit that's now locked onto the subframe, steering feel is more precise, while the Flex keeps its well-controlled ride and responsive brakes on tap. It’s a pleasant vehicle to drive, a step up from the likes of the Chevy Traverse and Toyota Highlander. Mostly, it's because of the superior ride quality, descended way back from the Volvo XC90 that spun off the platform of the Flex, the same one underpinning the Taurus, the Lincoln MKS and the MKT. Even the base Flex carries itself like a smaller wagon, with crisp steering feel and a compliant feel that comes from its long wheelbase, but great control over its body motions even when it's hustled in a way no family vehicle will ever be used. Trust us on this one. As large as the Flex is (it's 202 inches long, with an also-long 118-inch wheelbase), it's surprisingly manageable to park and drive around the city. It doesn't exactly drive small, but it doesn't feel much more cumbersome than a mid-size sedan. All the seats in both the first and second rows are cozy, with limousine-like room in every direction, and a choice of buckets or a bench. The long wheelbase pays off most here, but even the third-row seat has leg room for smaller adults, though head room is scant for six-footers. The Flex's comprehensive safety package includes six airbags, anti-lock brakes, and stability control with anti-rollover technology. A rearview camera is now standard, and parking sensors are available, as are a blind-spot warning system and adaptive cruise control. It also has options for inflatable second-row seat belts, adaptive cruise control (with forward-collision alert), and a blind-spot monitoring system. The Flex has earned mostly good scores by the IIHS, but only manages an "Acceptable" rating in the agency's small-overlap front crash test. The Flex hasn't been tested recently by the NHTSA. The Flex doesn't skimp on features. 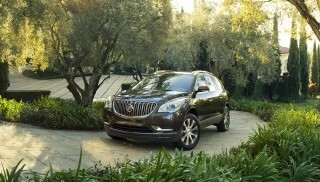 In its top Limited guise, it feels like a full-fledged luxury model. The base Flex SE comes standard with three-row seating; an AM/FM CD player; power windows, mirrors and locks; capless fuel filling; and MyKey, which lets owners set programmed levels for radio volume and vehicle speed, effectively putting an electronic leash on younger drivers. Upscale Flex crossovers can be fitted with the turbo-six engine; all-wheel drive (AWD); a leather interior; and a glass panoramic sunroof. All Flex SEL and Limited SUVs get the latest Ford infotainment system, which replaces the unloved MyFord Touch setup.The new Sync 3 infotainment controller responds more quickly and its screens have a less cluttered look. The Flex also has restored some controls to prominence on the center console: there's a capacitive panel that houses supplemental audio and climate-control buttons, and a physical button for the hazard lamps, though everything else (even climate controls) relies on touch. 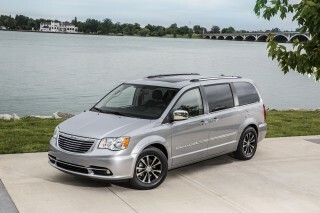 Base versions with the 3.5-liter V-6 and front-wheel drive are rated at 16 mpg city, 23 highway, 19 combined. All-wheel drive cuts into the numbers significantly: the AWD Flex earns an EPA rating of just 16/22/18 mpg. From there, it's another step down with the turbocharged Flex EcoBoost to 15/21/17 mpg. The Flex remains one of Ford's best styling pieces, effortlessly cool and relentlessly boxy. 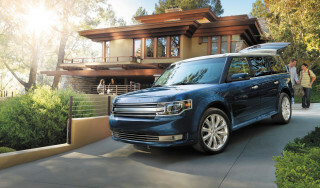 The Ford Flex stands out in the crowd with its hip, square, sleek looks. Space-aged surf wagon, anyone? Arguably, the Flex looks like an homage to the entire history of station wagons, but we can't help but discern a British streak down its sides. Volvo 245, Ford Fairline, Country Squire—it's all there, and to us, it's also part Range Rover, part Mini Cooper. It boldly forges its own style as it skirts around the "minivan" tag—and now it's even less "Ford," now that the badging's been removed, and only the "FLEX" name is tattooed across its nose. The only Ford mark on the vehicle is a blue-oval badge, on the lower right corner of the hatch. And is it just us, or does the new front end resemble nothing less than a USB port? Inside, the Flex's design essentially carries over, although there have been some subtle changes to the materials—with soft-touch materials now used in the upper door trims as well. The instrument panel sits low, while a round analog clock on the dash of the navigation-equipped Flex clearly pays homage to the Mini—down to the stamped-in ribs that flank it. The center stack makes room for the large MyFord touchscreen interface, along with capacitive touch controls for climate control and audio beneath it. 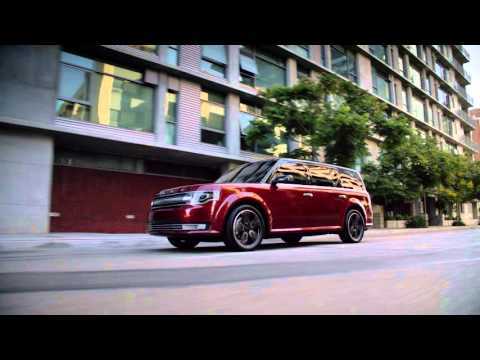 With turbocharged power, the Flex acquits itself as well as some sport sedans. Both of the drivetrains available in the Ford Flex have plenty of power, but we prefer the EcoBoost V-6 every time, especially since it doesn't exact too high a fuel-economy penalty. The base V-6 is decently muscular, but isn't blisteringly quick. It's the latest version of Ford's standby 3.5-liter V-6. In the Flex it produces 287 horsepower and 254 pound-feet of torque, and turns in better gas mileage than its turbocharged version. Acceleration off the line is adequate, but passing power is strong, even with a few passengers on board. The Flex's 6-speed automatic shifts smoothly, noticeably better than the similar transmission found in GM's big crossovers (Acadia, Enclave, Traverse) though they were developed as part of a joint effort. We'd advise you check out all-wheel drive if you live in the northern tier, but otherwise give it a pass, since it adds more lead to the Flex's feet—weight it doesn't need since it already weighs about 4,600 pounds. Turbocharged Flex SUVs make 365 hp and feel as quick as the number suggests, churning out torque in a seamless wave as the 6-speed automatic upshifts. These turbocharged crossovers get steering-wheel paddle shifters to go with their automatic, and a tap of a paddle gives a more manual control mode—though the gearbox will shift short of redline even without input. The system is smart and considers yaw and steering-angle sensors, as well as throttle, so if you're in the middle of a corner or still climbing a hill, it will stay in the lower gear; but if you ease off the throttle it will go back to the upper gear in as little as ten seconds. The Flex comports itself like a smaller station wagon, with fairly crisp steering feel and a compliant ride that only gets boundy if you hustle the Flex into deep, tight corners. 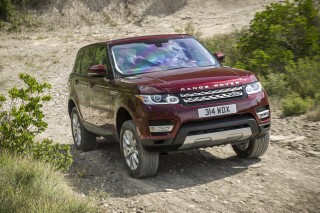 Despite its size, the Flex is almost in the fun-to-drive category. Ford's electric power steering system, is hard-mounted to the front subframe and has a quick steering ratio. Brakes were recently upgraded with more friction area and a larger master cylinder (plus different booster tuning) for improved pedal feel. Altogether, turn-in is now crisp, the steering loads up predictably, and there's even a little feel of the road coming through; the brakes have a noticeably stronger bite as well. 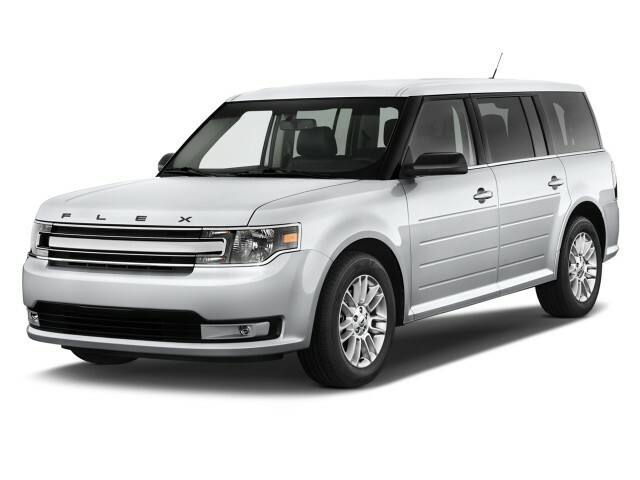 The Ford Flex is one of our top-rated family SUVs thanks to expansive cargo room and very comfortable seats. The Ford Flex is one of our favorites for big families who like to road trip—it's spacious, comfortable, and easy to enter and exit. It's also surprisingly luxurious, if you're willing to spend the extra coin. In the first and second rows of seats, the Flex has wide, well-cushioned chairs with an almost ideal mix of long-distance support and soft-touch padding. One of our few complaints—a long-running one—has been completely remedied now that the Flex has better headrests with a new four-position design. In the second row, you'll feel regal, there's so much head room and leg room. You can thank the Flex's Volvo roots and its emphasis on second-row comfort. Crossovers like the Traverse and Pilot have better third-row accommodations or overall interior space, the Flex is organized to make the front and middle seats as spacious as possible for everyone, not just the under-13 set. At 5 inches shorter overall than the 205-inch-long Chevy Traverse with a wheelbase just as long, the Flex is conversely 10 inches longer than the Honda Pilot. The third-row seats are thinly padded, but it's impressive that even our 6-foot-6-inch tall editor fits acceptably in the third row, with a slight hunch and knees slightly elevated; it would be fine for a jaunt across town, and it's relatively easy to get back there thanks to the roofline. The Flex is much quieter inside now than it has been in the past. In 2013, Ford added more sound deadening and lining to lower noise and harshness in the vehicle, and it works. Fit and finish look better than ever, too. Ford has done a good job in placing soft-touch materials up where the driver and front passenger most often put their hands, while upholstery and materials feel luxury-grade. With 83 cubic feet of space behind the front seats, the Flex has marginally less interior room than the Honda Pilot, and 20 cubic feet less than the Traverse. However, both its second- and third-row seats can be power-folded out of the way, and behind the third row, it can tote more cargo than the Pilot. New crash-test results raise the Flex's safety rating, and a rearview camera is now standard. With updated crash-test scores and a newly standard rearview camera, we're raising the Flex's safety score this year, after a couple of seasons in which its safety data was incomplete. The Flex offers a long list of safety technologies, and it's one of the safer family vehicles on the market despite being a descendant of the vintage-2002 Volvo XC90. The Flex fields "Good" crash-test scores from the IIHS in most tests, save for an "Acceptable" rating in the new small-overlap test, which mimics a collision with a telephone pole. The NHTSA hasn't updated its ratings for the Flex since it was brand-new. Going back to 2009, the Flex earned near-perfect scores, but the NHTSA has also updated its methodology since then. Among its standard safety features, the Flex has six airbags, anti-lock brakes; and traction and stability control with anti-roll control. All Flexes also include Curve Control and torque vectoring—both are software upgrades to the stability control system that help the Flex corner better. Over its life, Ford has also redesigned the front-seat headrests: in the older versions, the headrests pitched your head uncomfortably forward. The new four-position design still protects well against whiplash while improving driving comfort. Parking sensors are on the options list, and so are blind-spot monitors and adaptive cruise control. Ford's MyKey system remains available in the Flex; it lets parents or other owners set limits on the Flex’s stereo volume, vehicle speed, and other entertainment features, effectively keeping secondary drivers within the owner's comfort limits. Inflatable seat belts were new to the Flex in 2013, and adaptive cruise control (with forward collision alert) and a blind-spot monitors were also made available. The Flex remains one of Ford's best-connected vehicles with its new, much-improved infotainment system. The Ford Flex comes well-equipped no matter how you choose it, but checking off all the boxes not only allows it to compete with luxury cars in terms of options, but also in price. Across the lineup, the Flex has a comprehensive set of features. The base Flex SE comes standard with a power windows, mirrors and locks; three-row seating; capless fuel filling; an AM/FM/CD player; Bluetooth; and MyKey, which lets owners set levels for radio volume and vehicle speed, effectively putting an electronic leash on younger drivers. Upscale Flex crossovers can be fitted with the EcoBoost turbo engine; all-wheel drive; a leather interior; and a glass panoramic sunroof. 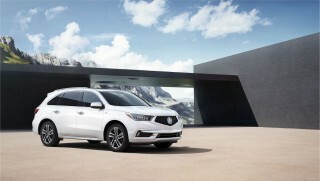 New this year is an appearance package that blacks out the trim on the roof, door handles, grille, and window sills. It's fitted with 20-inch wheels as well. A second-row refrigerated console is a feature that's not available in any other vehicle in this class. 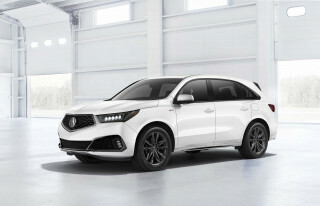 Other new features include rain-sensing wipers, passive entry and start, and a new feature that lets you go up or down a gear at a time on all models, not just those with paddle shifters. On Flex SEL and Limited, Ford's latest touchscreen interface becomes available. The old MyFord Touch system has been banished, and a new Sync 3 system is installed, with much better performance, cleaner graphics, and simpler operation. As before under MyFord Touch, Sync 3 combines climate, infotainment, and navigation features, as well as other functions. We've had a week with Sync 3 in another Ford car and came away impressed, but hopeful for more. The Sync 3 system still has bugs to work out and a little lag left in the system. Back in 2013 when Ford revamped the Flex's dash, it added some digital displays to the gauge panel, including a graphic tachometer. It also reinstalled some ancillary controls on the center console, functions that had been buried behind touchscreen layers. Now, there's a capacitive panel that houses supplemental audio and climate-control buttons, as well as a physical button for the hazard lamps. Newer three-row SUVs are better at fuel-sipping than the Flex. 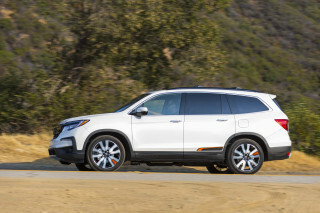 The Flex won't be the best choice if you're looking for top gas-mileage ratings in three-row SUVs, but considering its passenger-carrying capacity and its performance in turbocharged models, it's not bad. 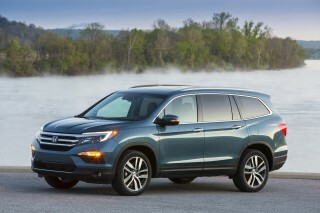 By comparison, the new Honda Pilot with a 9-speed automatic is rated at 20/27/23 mpg with front-wheel drive, and with all-wheel drive it's rated at 19/26/22 mpg.